Opening Session in progress- Late Dr. Sanga Sabhasri on the left, next to him is Dr. Anuwat Wattanapongsiri, the Minister of Science, Technology and Energy of Thailand. "We discussed why we, Asian cannot get together in Asian Region instead of in such a far away country as Costa Rica. We also realized that we do not know nor understand each other in the field of Remote Sensing, even though we live close to each other. Asian countries have our own unique problems which can be solved by Remote Sensing Technology". 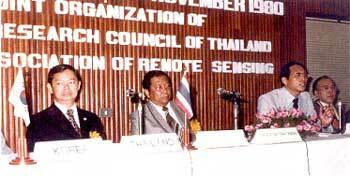 Conclusions of the discussion at that moment were that we, Asian should organize the Asian Conference on Remote Sensing reflecting our own ideas, and that we should get together at the geographical center of Asian Region, that is, Bangkok within the year of 1980. I did not expect to have so many participants from so many Asian Countries, 159 from twelve countries. I hope we learn many things and we promote our mutual understandings and friendship through this Conference." 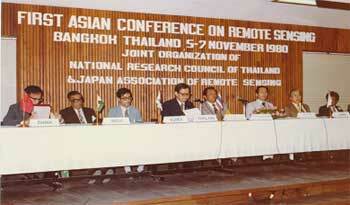 "I am much delighted to be here for the inaugurating of the First Asian Conference on Remote Sensing. It is indeed a great privilege and honor for Thailand to have been selected as the host country for the first conference. May I take this opportunity to welcome all of you to this memorable occasion. conf01-03Cultural activities has been a part of ACRS -here is the first one during the 1st ACRS on board the "Oriental Queen"
159 participants were registered from 12 countries and one international organizations. 157 participants came from 10 countries in the Asian Region, namely Bangladesh (1), China (8), India (1), Indonesia (1), Japan (17), Korea (1), Malaysia (8), Singapore (1), Sri Lanka (2) and Thailand (116). One came from USA, one from Netherlands(ITC) and one from UN ESCAP. 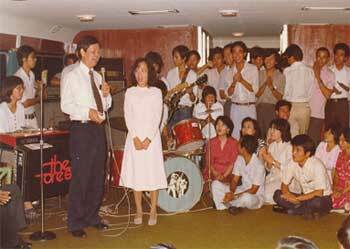 The representatives of each country met during the conference and decided to hold the 2nd ACRS in Beijing, China at the Friendship Hotel during October 29 - November 4, 1981.